And tonight, at long last, yes! 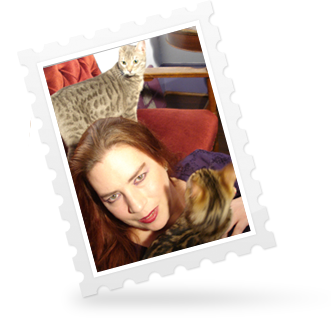 A Blog NOT about Bengals! No Bengals anywhere, not about them, or Bees for that matter. Just a few home chores. So, that wasn't entirely truthful. I'm a writer. Writers lie. All the time. And make things up. The fact that this Blog is based on fact and not fiction, which is entirely made up, makes no difference. Bengals creep in. If you have one, or especially if like me, you have five, they will enter into EVERYTHING in your home, your life, and your dreams. Real or not. They seem to like it, and are drinking from it, and playing in it. It will get more plants and then I will have a small Jungle out there for them. Couldn't get a picture of Magic in it, but I am sure before the summer is done, we will have little F1 Movies of him splashing about. I like to be artistic in my Gardens, and this is the Year Of Outside, the year when I actually DO things outside, and don't simply sigh and think it would be nice at some point. Hanging Baskets of Petunia Things are good because if you can remember to water them, and this is a big one, they will just grow, bloom and smell sweetly. It's watering, or lack thereof, that makes the difference. This is my Artistic patch of Creeping Charlie which will no doubt Take Over at some point, lessening my worries about anything else. I won't let the Mowing People (Hello? I didn't say I was going to do EVERYTHING, I know my limits and skills) mow it down. I like it. It's like a Creeping Lizard out there. Remember the day I decided to use Lawn-b-Green? Well it worked. Kind of. I sort of didn't have the Spreader theory down, and sort of didn't know it would only GREEN where you tossed it. My Neighbors say it looks like I tried to spell something in my lawn. Which would have been kind of cool, had I thought of it. And finally: A Wee Stone Path. All homes should have a Wee Stone Path, especially if you can find the stones on sale. Hooray for year of outside. I wanted some paving stones for around my new heirloom tomato bed, but didn't have, you know, measurements or sizes or anything. Maybe a bit later this year. Purple flowers. Fountains. Bengals. Words in grass. what's not to love about this all? love the flowers, love the bengals, love the fountain. i think my favorite but is how every picture is at a different angle. it really draws attention too some of the details. ooooh! i saw david duchvney today. they were filming californication in the courtyard of my office. Verra nice! I think you could still go out and spell stuff. You have the purple flowers thing going great. Did the hosta along the stairs come back? I love the wee stone path, and on sale is a Great Thing, second only to the holy-of-holiest- FREE. I think, due to doggieness in the yard I am going with Big Wide Paths, all of cedar mulch. Less for Spawn to mow too. BTW- Creeping Charlie gets sold in some garden centers as "Ground Ivy", so it can be as much an Official Lawn Plant as you choose. I'm so behind reading, let me know if I missed anything exciting. Yard plans and Bengals! Love it! Ooh, I want a wee stone path! Pretty! Love the petunias in baskets, too. I have a flat of flowers sitting out front waiting to be planted. I'm hoping to finally get them in the ground tomorrow. Those strange hieroglyphs there are a message for you from Ally. I don't know what they mean, but after she typed (well technically pawed) them, she licked and licked my hand, then marked the edge of my netbook screen with her slobbery cat lips. So I can only assume she means to tell you that she approves of a non-cat post which is actually about cats. Wee stone path! I like that. That's very nice. And hanging baskets! I still haven't bought any. Six years and I've never hung baskets. I had some potted mums on the porch, once, but neglected them to death. As you say, water is crucial. What are the tall purple flowers on the side again? They're looking mighty happy. You have possibly shamed me into doing some yard work tomorrow. We shall see. Love that first shot. Freaky Venus indeed! Really love the path. Spooky House is looking great. And outside is so good. Been doing more of that myself this year and it is so good and, and, and... real, you know. I am guessing you might be getting your storm about now as it has left us in the dust, but it may have gone a bit to your north. It cooled things down nicely here. I think "left us in the dust" was the wrong way to say that as actually it left us more in the mud than the dust. Tall purple flowers are Phlox, and going great guns at that. No storms here, not even close. Sigh. The purple flowers are Flox and the hill behind the house is FULL of them. And my lilacs I planted last year bloomed! Smells pretty neat. Not only did the hostas come back, Beez, I am getting MORE. I had all the neighbors over tonight to see the gardens, I walked around the block with the cats and gathered them. I am going to let Magic stay OUT tonight. Even opened the basement to him too. I'll sleep down here with him and Venus and Mim. I love the stone path! "Every home needs a wee stone path." Indeed. Especially if it will prevent one from landing on one's arse when attempting to negotiate that tricky bit of slippery grass /mud between the neighbour's carpad and one's letterbox. Ahem. It all looks and sounds lovely. And I particularly like that first picture..
AH. I am reminded that somewhere under some bits of grass we have a wee stone path of our own. Perhaps some archeologically-minded young person could be persuaded to unearth them. Or I could, after I get the rest of the plants planted....they aren't going anywhere. Love the creeping charlie...an avatar of Fat Charlie, perhaps? Waiting for the "we all slept like babies together" post. Could be a long wait? Cloudy and not too hot yet- looks like Transplanting Day is here. Love the purpleness & wee path! Ooh I cannot wait to have my very own Outside! My friend took me to a garden centre at the weekend, she knows lots about gardening and will hopefully help me not to kill everything I plant! I'm still a bit sad about having to get the weeping willow cut down though, or the whomping willow as I was already affectionately calling it. Boo :o( It really will whomp the house if we leave it though. Well, pretty good. Magic walked thru trilling from time to time, this is a thing EG Bengals do, doesn't sound like a cat. Mim peed on the pillows of the fainting couch, she has been having pee issues since before Magic tho. She pees on my feet too. She wants OUT. And the ROyals went nuts with affection when I went up with food this morning. SO goes the Magic Being Out. OH! Magic is also letting me reach out and touch his nose!!!!!!! This is huge, and he watches when I pet and talk to Venus and Mim! And he comes when I switch rooms and call everyone. That is so amazing lorraine!! Such a sweet scene (well, except for Mim's issues). Thanks for the pictures and news from your garden. The petunia baskets are lovely! Wish I had been there for some talk as you worked.... Well of course, I would have helped! love Venus - She's all "MY fountain!" I really like your paving stones. Did you find them online? Ooo...What a wonderful evening adventure. Congrats on the nose touching. I'm so grateful for the storm bringing cooler temps. I have an appointment for pet resistant screens, but not for a couple of weeks. We've been dying of heat since I can't open the windows all the way (or the clever boys bust outside). Have you tried self-watering hanging baskets like these at http://www.gardeners.com/Self-Watering-Hanging-Planter/SelfWateringPlanters_Cat2,34-368,default,cp.html? I bought one for a friend of mine and she says they're great. Martha! I forgot you were in town and likely to have been off school now. Rats. SHould have called you. Self watering hanging baskets? Sign me UP! I found the stones at a local garden shop, just there and cost nothing...Unlike their fountain. The flowers are very nice. For Purple. Jay the superbuilder of Things (like Cat Trees) has paved a path from our house to our shop, with flat stones he fished out of the river one-by-one, and brought home in his boat. We have a dam and WATERFALL in our back yard, also built by Jay, but it only has water when it rains. The cats will sit down there and bother toads but do not play in it. I think it is cool the bengals like the water, do they go in the hottub? The weeds in my lawn are yellow...you're welcome to take those! But I dont know what they are. They do make my lawn more green though, the weeds are definitely healthier than the grass. Doesn't bother me though, I can't eat grass. The part of my garden that gets my attention is edible--the rest is just there. Wow. I have house envy now. Even though I know I'd probably never take care of the outside properly. Just as well that I'll be a life-long renter, most likely. It's been so hot here in Chicago, my cleaning and cooking plans have gone all awry. If I don't get my act together tonight and tomorrow, I'm in for a world of embarrassment come Friday. Then again, right now it seems that hardly anyone is coming to the house concert I'm hosting that night. I guess I should have let someone with better connections volunteer. I'm glad Marian has a real gig in town the next night, but I still feel I'm letting her down. Well, back to cleaning. Even if I only get a handful of people, things still need to be cleaner than they are. Lovely, lovely, all the way around! It's so good to know that Magic is starting to blossom. He deserves that, ya know? As for weeds and such.... Technically, GRASS is a weed. It's just a weed that humans decided they wanted to cultivate and to nurture. Me, I'd rather have a yard of native plants and prairie grasses. Better for the environment - no watering or mowing required! plus it makes a great refuge for bees, bunnies, and birds - and more interesting than a big, green patch of sameness. I never have understood the NEED of some of our neighbors to have a perfect lawn. They're out there mowing and raking and plucking and watering. It's a ridiculous waste of time and resources, if you ask me. Oh, to have about $20,000 so I could call up Prairie Restorations and tell them, "C'mon out and prairie up my yard, guys!" I also like the stone path. Was it wickedly hot in your area today? RI was practically in flames. You know. The humid kind of ... moisture flames. Wow, I am seriosuly impressed about Magic. So good. I am a little envious of the heat you are enjoying. As much as I have been complaining about the cold and rain, I prefer it to hot and melty. How did Magic do at home human-less today? I was going to say home alone but he wasn't was he?! Sally, I sure wish I could send you some of this heat, for I am not enjoying it. Not one bit. Too bad I can't be a reverse-snowbird, moving every year to escape summer. Phoebe and I are very annoyed with each other right now. It's taken two days to trim her front claws, and I'm still missing two needle-sharp points. She used to be so good about this, but now she's a terror. I don't know why. I've only clipped the quick once, and that was years before she started fighting the trims. For a while I thought maybe she was getting arthritis and it hurt when I handled her paws. But she makes no complaint when the vet does it. Sure, the vet already intimidates her, and I don't. But sheesh, cat, this is getting painful. I'm curious to hear how the unsupervised mixed cat day went. It's astonishing to hear how far Magic has come. Hey OSS-- saw ms call tonight. Got there a bit late so ended up in a side room so couldn't really see her but could here very well. She was great! You will have a wonderful time I am sure. A small group will be wonerful and intimate. Umm I meant "hear" of course. It's a brain/finger/iPhone thing. Just home from riding, we went to both places. All looks well with Magic out and about. Haven't FOUND any pee, he was in the bed on the dinning room table. Venus and Mim were happy to see me, and everyone had dinner, lots of coming close, and a foot sniffing, but he didn't do anything dramatic. I pet him while he ate on the counter. He is back in bed washing. Dim was a WILD horsie. I got bucking on the lunge line! WOrked the heck out of him into a sweat before I rode, I can tell you that. Someone needs to do that for me. OK, what the hell does " I got bucking on the lunge line! " mean?? Hee-hee. Lungeing is what one does with a Horsie for warm ups. It's a long line, and you stand and the Horsie runs around you, in a circle. Tends to make you a bit dizzy, but it's a good thing to do before riding. If Horsie is pretty wild, he can buck, and rear, and well, be a wild thing. He was feeling frisky, and bucked like a bronco. When they do that, you crack the whip good and make them go on. And on and on. Until the take the gait by voice commands, stop when told, reverse directions and carry their heads well. This blog is such an education! I am drinking mango Sangria that I made yesterday for a date thing. Just thought I'd let you guys know. Also, I think I can officially consider Kitty having a peeing problem. Hopefully changing back to the blue package of kitty litter will help things. Your Bengal stories are so enjoyable to read, and added pics (with water... and wheel ooh, combination cat toy) are a fav. Thank you. And Magic has shown some amazing behavior lately. He really has the perfect name doesn't he. Magic. Very sad new post up, the kind that brings tears...And determination.